It's been a few years but Electric Orange is back with more of their classic cosmic Krautrock, though this time with a bit of a twist on some tracks. 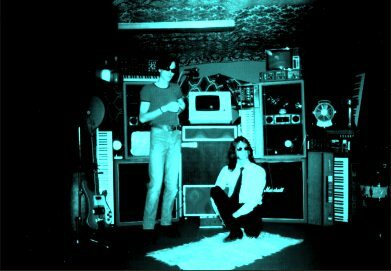 The band still includes mainstays Dirk Jan Müeller on Hammond, Farfisa, Rhodes, Mellotron, synths, samples, and loops, and Dirk Bittner on guitar, bass, drums, samples, rhodes, synths, and vocals, and are joined on Abgelaufen! by Tom Rückwald on bass, and Eric Karow on drums and percussion. "Off" opens the set full force. God I love that organ!! It's a heavy rocking tune with healthy doses of funk and soul, but with firm Krautrock and psychedelic roots. Imagine the Spencer Davis Group and Sly and the Family Stone with full in-yer-face Hammond and tripped out funky guitar. "Zwiestück" features funky rhythms and spacey keyboards that remind me a lot of Can, and Bittner's vocal style sounding like Damo adds to that feel. "Hydrat" includes similar rhythms, but is more overtly space rocking, even sounding a little like Farflung. "Dym" is one of the highlight tracks, opening with a riff that reminds me of an Iggy Pop song I can't remember the title of (Calling Sister Midnight?). But I shouldn't confuse you because this isn't garage punk Iggy music. The music is very dark, and has a strong progressive chamber rock edge, but also has a spacey exploratory feel. The band make good use of the track's 10 minute length, evolving through multiple thematic passages, some being somewhat experimental sci fi/horror movie styled. Lots of cool crazed voices. But it also brings to mind a more space electronic version version of Univers Zero if you can picture that. Definitely a track that requires multiple listens to really tune into. "Bandeins Swingklar" is similar to "Dym", being dark and highly thematic, with lots of spacey elements and a parade of varied sounds, plus a careful measured use of percussion. The music moves along slowly but, like "Dym", the music reveals more of it's subtleties with each subsequent listen. "Golden Lake" is another standout with a deep head-throbbing bass, Phantom of the Opera organ, and bits of trippy guitar that lay the foundation for this somewhat psychedelic gothic song. I really like the orchestral Mellotron background accompanied by pounding tribal drums, quietly swirling synths, and alternately acidic and ethereal guitar. "Gruff" is similar, but the synths are much more in the forefront and there's a narration by an efx'd robotic voice. Finally, "Ganus Abgelaufen" builds very slowly over it's 15 minutes length (the longest track on the disc), working its way through subtle space jams that meander through a dark cosmic tunnel, gradually growing in intensity, the pace never exceeding a drugged but deliberate crawl. In summary, Abgelaufen! is a strong return for Electric Orange. There's plenty to satisfy their long-time Krautrock fans, having left all traces of the dance elements behind, but also delves into progressive rock realms. And, as we discover in the interview below, both Dirk Jan Müeller and Dirk Bittner have been plenty busy with a variety of musical projects over the past few years. AI: Abgelaufen! is Electric Orange's first release in a while, the last one I remember was the 2-CD release on Delerium, though I think that was a reissue of earlier music. Was Cyberdelic in 1996 your last studio release? Dirk Jan Müeller (DJM)/Dirk Bittner (DB): Yes, Cyberdelic was the last studio release. The Double CD was a reissue of the first album from 1993 with a bonus CD with previously unreleased material of us from 1992-1994. In the time between the "Cyberdelic" and "abgelaufen!" we did a different project (Bloop). AI: Looking at the credits on Abgelaufen! I only recognize Dirk Jan Müller and Dirk Bittner's names from the earlier releases. Are the two Dirks the originators and main forces behind Electric Orange? How long has the band been in existence? DJM/DB: We two (2 x Dirk) are Electric Orange since we met in a studio in 1994. DJM founded Electric Orange in 1992 with some guest musicians and did the first record. AI: Has Electric Orange been doing any live performances with the lineup from Abgelaufen! or any planned for the near future? DJM/DB: No gigs so far with the abgelaufen! line-up. We planned some dates spring/summer, some as a duo (one is the 10 Years of Manikin Festival in Bad Sulza, were we've played twice). And in summer there will be some gigs as a whole band, but at the moment we don't know exactly who will be in it. Maybe Tom & Eric from abgelaufen! and maybe an additional guitarist. AI: I see EROC's name in the credits on Abgelaufen!. How was it working with one of the pioneers of German Kosmiche/prog music? DJM/DB: We needed someone for mastering who understands our style of music, so we decided to contact EROC and ask him. DJM met him about 10 years ago and stayed in loose contact. EROC has lots of experience in recording music and he is a very friendly, funny guy. So working with him was a pleasure. While working it was nice to hear some old stories and jokes. EROC did master many old 70s records and our production was similar (because we are working with a lot of old equipment), so he did the right sound for us. AI: I recall listening to the CD just after learning of Michael Karoli's (Can guitarist) death and thinking how much "Zwiestück" reminds me of Can. Any influence or relation worth mentioning? DJM/DB: Sure, there is a Can Influence. One of our favourite bands. But we did not plan "zwiestück" to copy the Can-Sound. The Track was born out of a session with a old drum-machine, where Eric played drums to later. So this motorik-Can-feel occurred. The funny thing is, Eric the Drummer and Tom the bassplayer don't know any Can-record nor the band itself. When you hear rhythms like that, you mostly think of Can, or not? AI: The Abgelaufen! Story on your web site says it's only in German because an English translation wouldn't make sense. I won't ask you to translate it, but could you give us the basics? Am Eingang steht Ganus. Die Dirks nehmen einen großen Schluck. Den haben sie vor Monaten vor Winkens gefunden... "Abgelaufen!" At the entrance stands Ganus. The Dirks take a big taste. This one have they month ago before Winkens found… outdated? AI: Electric Orange has covered a lot of ground. 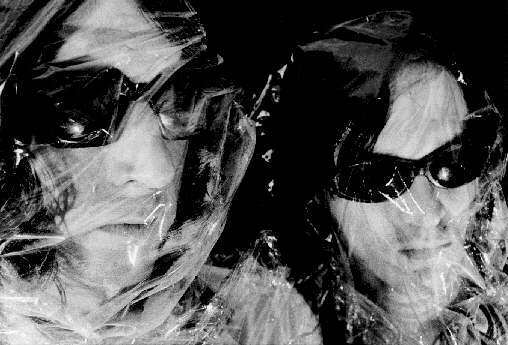 From space/Krautrock, to electro dance explorations. There's definitely a space element on Abgelaufen!, but the music has a much darker feel and I hear more prog rock stylings too. Much of the music is also highly thematic, much like a film score. 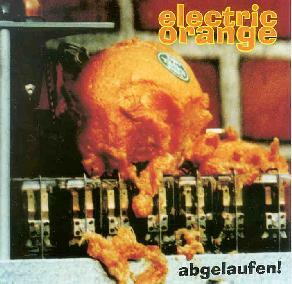 DJM/DB: Electric Orange was initially a Krautrock-Project. In 1994/95 some dance elements came into the music, because of the reason we personally liked upcoming styles of music (Trip Hop etc.). But after "Cyberdelic", where we combined Krautrock with …, we decided to keep these influences out of EO, because the intention has gone out of the way where we wanted EO to be. Around 1999 we got tired of these dance-styles and we got back to the roots… The darker feel was not planned, the first time we heard about that from people who listened to "abgelaufen!". This feel must have come from the atmosphere in our studio where we played the basic-sessions at night. To us it doesn't feel so dark, but if people think this, it's nice. Maybe it's a film score of our own mind and the listeners mind, too. AI: Tell me about the homemade releases on your web site. Is this music you wanted released but had to do youself due to lack of label interest, or are these just special releases for dedicated fans? DJM/DB: Both cases. "Rechnung Offen" was intended to be the follow-up to "Cyberdelic". We planned this as a EP on Delerium, but that did not happen. 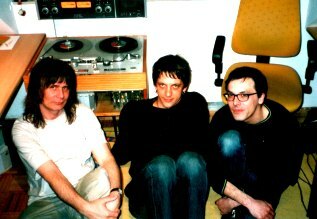 "Zwischenplatte" consisted only of lone tracks which were not especially produced for a planned record. The Other CD's are old sessions or tracks which lay around for years, mainly interesting for people who already got all our official CD's. Or some are remixes or demos of tracks appearing on compilations or regular EO-CD's (example: 3 tracks remixed for "Orange Commutation" which weren't used by Delerium). AI: Tell me about the Totales Brummen CD. It certainly shows a more experimental side to Electric Orange than I've heard before. AI: I was listening to some of the early 1990's DJM solo sound files, which have a strong Tangerine Dream styled cosmic electronic influence. Was this the kind of music that first inspired you to be a musician?..... Or the first style of music you recorded? AI: I see on the Electric Orange web site that both Dirk's have been involved in several bands. Have these been an evolution for you, one leading to the other, or have they occurred simultaneously to satisfy your various musical interests? AI: I listened to a couple of the Bloop tracks, which is heavy electro-dance music. Were the live tracks recorded at Raves? It sounds like it. AI: Any other news or future activities our readers should be aware of? DJM/DB: One new EO track will be on a sampler of Manikin-Records. This is the "10 Years of Manikin" CD release for the festival mentioned above. The CD will be released in April and the Festival is 5.-7.April. More info go to http://www.manikin.de. Some basic Sessions for a next record were recorded last summer. At the moment we still have work with the promotion of abgelaufen! and getting some gigs for the next time. For more information you can visit the Electric Orange web site at: http://www.electric-orange.com.